We start our day off the way most Vietnamese people do, with a hot bowl of pho. My favorite pho place in district 1 is Pho Quynh (323 Phạm Ngũ Lão), but you can find a delicious bowl almost anywhere. Pho: The types and how to eat it. After breakfast, walk down Pham Ngu Lao to see the chaos that is the backpacker district. You’ll be offered scooter rides and rentals as you traverse the cluttered sidewalk. Note: This is the most dangerous area for purse snatching in the country. Keep your valuable close and be smart. Motorbike drivers will come right up on the curb and snag your bag, dragging you down the street if they have to. I’ve never experienced it, or witnessed it, but I know quite a few people that have. Cut down the hem (which basically means alley) called Hẻm 283 Phạm Ngũ Lão. Feel free to get a little lost in these alleys. They’ll give you an idea of how many houses are packed into this area. Some of the alleys aren’t marked on the map, but eventually you want to end up on Bui Vien. Take a left on Bui Vien and it will lead you to Tran Hung Dao. One of my favorite spots in the city is where Yersin and Ky Con meet. This art deco flatiron building is often called the Nguyễn Văn Hảo building, named after the former owner, who made his money in the automotive industry selling parts and opening one of the first petrol stations in Saigon. Currently, it’s in pretty rough shape, but apparently some of Van Hao’s family still live in the building. If you still haven’t had your morning coffee, detour down Ky Con to Sainte Coffee, a small but cool place to grab a cup of Vietnamese coffee. After your caffeine kick, you can explore this neighborhood if you want – just go further down Ky Con and take you first right, then take a left and go back up Yersin. You’ll most find hardware type shops, but the shaded streets are pleasant. Or, just head back up Ky Con and continue on Tran Hung Dao to the roundabout where you can test your crossing-the-road skills. Crossing the road in Vietnam is pretty much famous. The trick is to go slow but remain consistent with your speed. Cozy up to a local and use them as a helper if you are scared. The scooters will go around you. Watch to see which side of you they look like they are going to go, and adjust your speed accordingly. Above all, don’t do anything sudden or unpredictable. 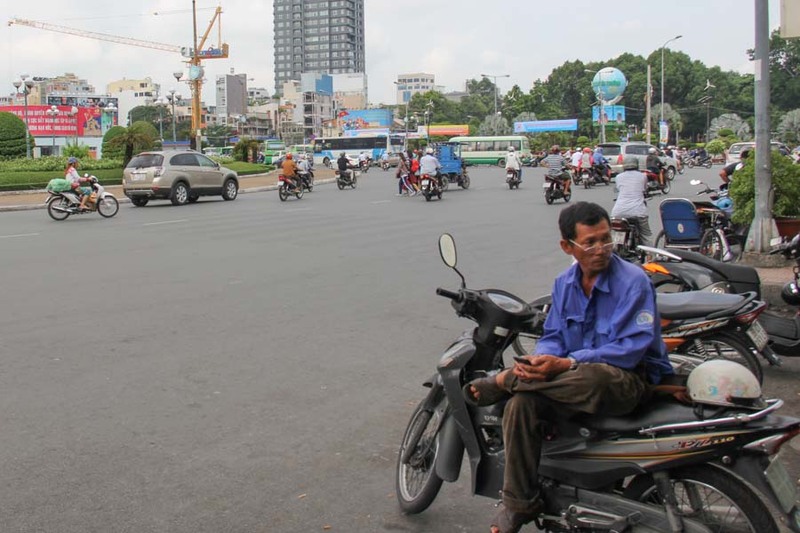 On the other side of the roundabout is Ben Thanh Market, one of the best known tourist attractions in the city. The market is pretty big and easy to get lost in. Shopping here isn’t recommended unless you are a skilled barterer. The quoted prices will often be 3 times the amount the item is worth. If you can understand Vietnamese, you might hear some insults thrown at you, especially if you engage with the vendor and then decide not to buy. Ignorance is bliss. At the north end there is an area to eat. The prices are higher than the rest of the city, but the food is pretty good (and still cheap). It’s also the location of the wet area of the market, where meat, fish, and vegetables are sold. When you can’t take anymore, exit out the west side of the building (you entered through the south entrance) and head down Nguyen An Ninh. This area has a large Muslim population, mostly Malaysians I believe. Go one block to Trương Định. On the corner is another tasty bowl of noodles. The often packed bun moc place, serves up a plethora of pork along with amazing broth and rice noodles that are different than the ones found in pho. After filling yourself with pork, go north on Trương Định and then right on Lê Thánh Tôn. 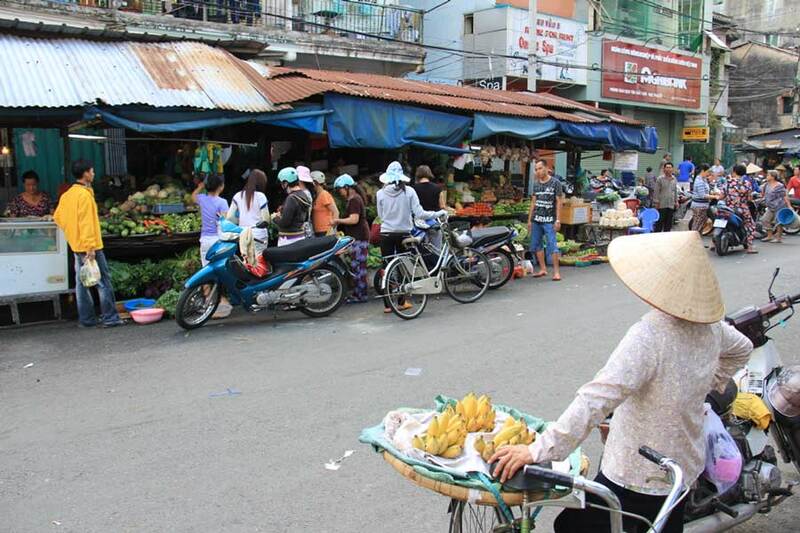 You’ll reach the backside of the market where you can take a left on Thủ Khoa Huân. For high-end souvenirs, the House of Saigon (on the right side of the road) is trendy but maintains some traditional Vietnam in their products. A little further up the street, you can duck into the new street food market, which has food vendors offering all kinds of national dishes. Again, prices are higher here and the food is just alright. Turn right at the end of the street onto Nguyen Du. Walk about 300 meters and turn left towards Reunification Palace (sometimes called Independence Palace or the Presidential Palace). 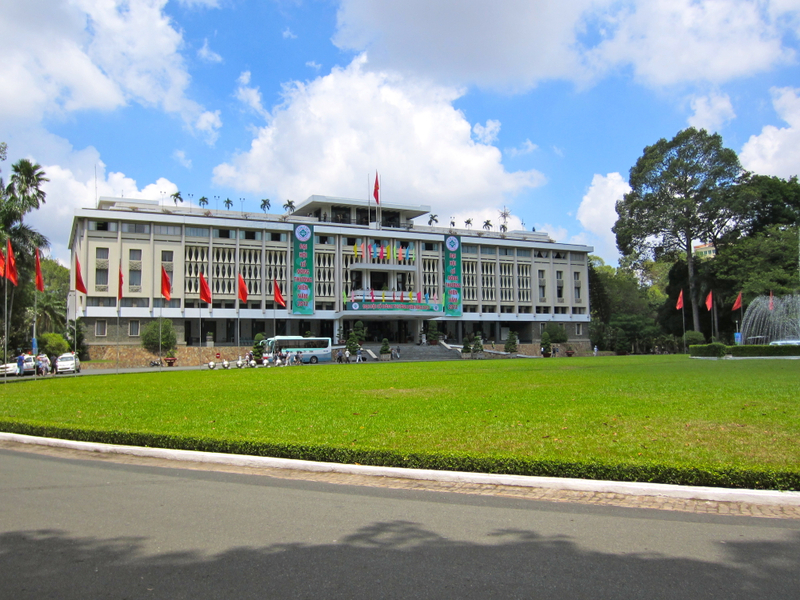 The palace is probably most famous for images of tanks blowing through the gates at the end of the Vietnam war (the same tank can be seen on the palace grounds). Not much has changed since that time. The palace was pretty much left in the condition it was in 1975, which is best described as Bond-villain-like with its 60s motif, underground bomb shelter, and rooftop helipad. Take a tour of the palace. When you’re finished, go left out the gate (northwest on Nam Kỳ Khởi Nghĩa). Turn left on Võ Văn Tần. After 1 block, you’ll reach the War Remnants Museum. The museum is often met with mixed reviews (some say it’s too anti-American). You can explore the grounds, looking at old military vehicles and some reconstructed prisons, then head inside for photos and items that recap the Vietnam war and show the horrific affects of chemical weapons like Agent Orange. Some of it is very disturbing. Back on Võ Văn Tần, head back the way you came, but stay on the road until you reach the roundabout. Lining the giant circle are coffee shops and plenty of circling motorbikes. You can actually cross into the center and hangout around the small pond which is referred to as Turtle Lake. Some say that the large structure in the center of the roundabout is suppose to be a giant sword handle. Legend has it that there is a humongous dragon under the ground and the sword is holding it in place. The road directly opposite of where you came in is Tran Cao Van. Go just a few meters and on the left you’ll find a place called Bánh khọt Cô Ba Vũng Tàu. This is a great place to try banh xeo. Banh xeo is a specialty of the former capital Hue. For 2 people, you’ll only need to order one. This giant crepe-like pancake is filled with shrimp, pork and bean sprouts. Rip a piece off and put it into a leaf of lettuce along with some herbs. I like thai basil (the one that smells like black licorice). Roll it all up and dip it in the nuoc mam – the sweetened fish sauce. I’m sure there are a few things that don’t sound all that appetizing about this (fish sauce, black licorice), but trust me – this will be a highlight of your trip. After that, waddle your way back to the roundabout and go left down Phạm Ngọc Thạch. Continue until the street ends and you reach the back of the cathedral. Take the road on the right side of it and do a loop around the Notre Dame Cathedral. When looking at the front of it, the post office is to your right. The Saigon Central Post Office is definitely worth poking your head into. Just to the left of the post office (and the McDonalds) is the relatively new Book Street, which is a great example of how Saigon is changing. Head down the pedestrian street. There are many cool cafes and some decent pedestrian watching along here. When you reach the end of it, go right on Hai Ba Trung. This busy street is named after the Trung sisters who were actually military leaders in 40 AD. They are considered national heroines after defending the country against the invading Han people. Continue down this street for about a half of a kilometer. Go right when you reach Công Truong Lam Son (the Park Hyatt is on the corner). Down this road you’ll come up behind the Municipal Theatre, more commonly known as the Saigon Opera House. It’s a great example of French architecture in Saigon. When you reach the next block, take the street in front of the theatre and head into the giant pedestrian square. While in the heat of the day the square is usually pretty quiet, at night it’s vibrant and exciting. Make a note to comeback at night and pat yourself on the back for following instructions so well. To your right, at the very end of the square, is City Hall. To the left of that, on the corner, is the Rex Hotel. Vietnam War buffs will know it as the location of the daily military press hearings — often referred to as the 5’oclock Follies. What’s commonly known as the apartment cafe. Heading away from City Hall, on the left, you’ll see a giant apartment block with many balconies. On the main floor is Fahasa Book Store (the government-run bookstore that can be found throughout Vietnam). This building was once apartments, but when the square was opened in 2015, the apartments were renovated into commercial spaces. There are 9 floors and about 4 shops per floor. Many of them are cafes but there are also some fashion boutiques. One of my favorite desserts in the city is on the 3rd floor. Mango Tree serves shaved ice with fresh mangos and condensed milk. It’s amazing, and I’m not really a dessert guy. If you’d prefer a cup of coffee of tea, there are many options in the building, but keep in mind that each place has a balcony and the higher you go the better the view will be. After leaving the building, cross the square and head down Tôn Thất Thiệp. There are many bars around this area. If you can squeeze in another meal, on the right, before the end of the street, is Thanh Xuân Hủ Tiếu Mỹ Tho. Hu Tieu is a very popular soup in Vietnam, but it’s pretty rare to see it in western Vietnamese restaurants. This version is filled with seafood like shrimp and squid. At the end of Tôn Thất Thiệp, is Pasteur Street – named after Louis Pasteur. This is one of the few streets in Saigon that has kept it’s French name. You have 2 options here and one of them involves beer. You can go right for a block and a half to 67 Pasteur, where you’ll find the Pasteur Brewing Company. They’re the first place to brew craft beer in Saigon. You’ll have to go down an alley to reach the steps that take you up to the bar. Inside is a cool narrow interior and a tap-filled bar with some amazing brews. I like the Jasmine IPA, but they don’t always offer it. When you’re done, head back the way you came on Pasteur Street and go right on Le Loi then take your first left on Nam Kỳ Khởi Nghĩa. On the corner is Saigon Square, where you can get lost in the vendor stalls while browsing knock-off clothing and accessories. If beer isn’t your thing, go left on Pasteur then take your first right, then another right onto Nam Kỳ Khởi Nghĩa. One block up, on the left-hand side, is Saigon Square, a complex of shopping stalls. You can get cheap clothing here – mostly knock-off brands. You probably won’t find much to buy, but the maze of stalls is worth a quick look. When you’re finished at Saigon Square, take a left at the next corner (Le Loi street). This will lead you back to Ben Thanh Market. This concludes the tour. We hope you had a great time. Don’t forget to tip your guide by leaving a comment below. And grab my free guide to Vietnamese food with over 75 dishes! This is an amazing tour, I have friends a overthere at the moment, I sent them your tour! I’ll do it the next time I go… Many thanks! Thanks for the praises, and thanks for passing it on to them.